The Data Importer Application is used for importing gpx and shp files which can then be converted into features using the Data Maintenance Application. Users can access the application through the online portal. The User Interface is organised into a number of key areas. The main toolbar, panels and footer. The application is intended to be used in both desktop environments, and with touch devices. For this reason the User Interface has been designed with touch in mind. The top toolbar holds the main tools that the editor is expected to use. These are the significant tools that will be used repeatedly. The toolbar will automatically hide and show the tools according to whether the user can in the current context use them. This is intended to further simplify using the application. The panels to the left, can be opened and provide access to editing attributes, changing selections, re-ordering layers and other tasks. The available panels will change according to the context in which the user is working. The footer contains a number of more advanced tools. It allows which layers are involved in selections and snapping to be shown. The footer will change its content depending on the tool that is currently selected. Above the footer, is an activity indicator. When data is being retrieved, or the application is working, the activity indicator will shuttle backwards and forwards. Many activities are temporarily disabled whilst the application is fetching data or running an operation. Any operation that makes a physical change to data is added to an Undo / Redo stack. The Undo command will allow the previous operations to be 'undone'. The Redo command will allow the previous undo operation, to be re-applied. The main menu has a pan tool. When this tool is selected, it is possible to pan the map by holding down and dragging the map. The application has been configured with a Find Panel. Clicking on the Find button, on the left hand side, will open the Find Panel. 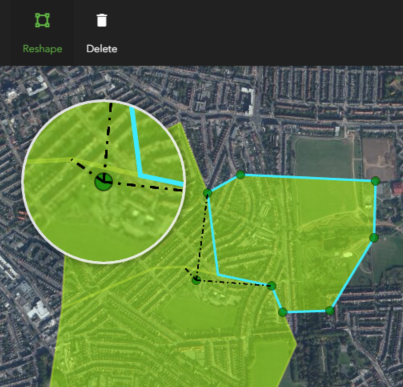 The Find panel remembers previous searches, so you can quickly zoom to previously found locations. The panel also has the ability to bookmark the current extents, or results of searches. This is a convenient mechanism for remembering common locations. If you have a selection on the map, it is possible to zoom to the extent of the selection. It is possible in the application to control the order and visibility of the layers in the map, and choose which basemap to show. The Layers Panel can be used to control the order of layers within the map, to change their transparency and visibility and to view a legend. The panel is launched by clicking the layers command on the left hand side. To change the order, click on the drag handles on the layer, and move to its new layer position. Clicking on an individual layer header, will show the legend for the layer. 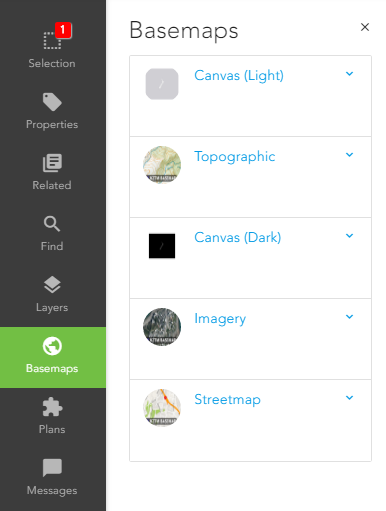 The base maps panel, makes it possible to change the base map that is being shown in the map. This is useful if the map is cluttered and a simpler base map is required. The application has a selection tool that allows you to make selections. There are a number of ways of using this tool and working with selections. You can have more than one feature selected at once, and you can select multiple different features from multiple different layers at once. When you have a selection, additional tools and panels will become visible. The Select Tool allows for features to be selected on the map. With the tool, the user can drag a rectangle, and all features that intersect this rectangle will be selected. When you make a selection, the selection button on the left hand side will show how many features you have selected. The selection panel allows you to see what you have selected. It also allows you to remove individual features from your selection, or all the selected features from a layer. If you mouse over any of the selected rows in the panel, they will be highlighted in the map. Similarly if you move your mouse over selected features on the map, they will be highlighted in the panel. To remove features from your selection click on the adjacent blue cross. There is a tool at the top of the selection panel, which will zoom the map to the extent of all the selected features. How to work with features. Creating, deleting and modifying features. To create new Features click on the 'Create' command on the main toolbar. Once the tool is selected click on the map to begin drawing a feature. The type of feature that the Create command will create, depends on what has been chosen, using the choose tool. 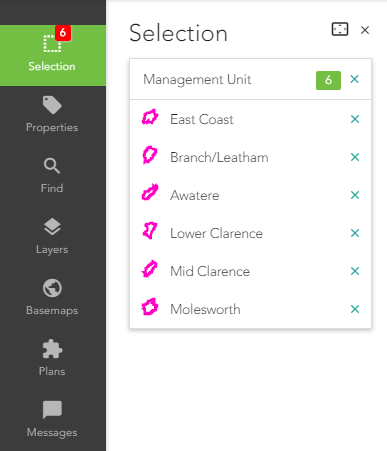 The choose Tool opens up a panel of all the types of feature that can be created on the map. When features are created all of the configured rules will be applied. If the feature drawn has missing attribute values, the Properties Panel will open, for the editor to provide the missing values. The delete command, is available once features are selected on the map. Clicking the Delete command will cause all features in the selection to be deleted, including features from different layers. If there are features in the selection, that cannot be deleted, then the delete command will be unavailable. There are many different ways of modifying features, from reshaping their vertices, appending or subtracting regions or changing the feature properties. These are explained below. When an individual feature is selected, the append shape is available. With this command a new shape can be drawn on the map with the digitising tools. When the shape is finished it will be appended to the original shape of the feature. The full set of geographic rules will be run, to ensure that the data is still valid, and any specific rule logic is applied. If the feature being edited, cannot overlap other features, then the 'clip', 'cut' submenu options are available. These options determine whether the new region will push itself into the neighbouring shapes (and they are automatically modified), or if the shape is clipped to the boundary of the other features. The Subtract command, works in a very similar fashion to the 'Add' or 'Create' commands. The user must select a feature. Once there is a feature, the Subtract command will be available. Once a shape has been drawn on the map the region will be subtracted from the feature. The Split Command will automatically split a feature into two, based on a digitised shape. Any part of the feature in the drawn region, will be split from the rest of the feature. When the feature is split, all of the configured rules will be applied. The properties will be copied across from the feature being split. If several features are selected, all belonging to the same layer, the merge command will be available. This command will merge all the features together into one. The properties will be copied from the first feature selected. The reshape command allows for the individual vertices of a feature (or group of features) to be repositioned or removed. When the reshape command is selected, all the vertices of the feature will be displayed. The reshape command also makes it possible to add new vertices. 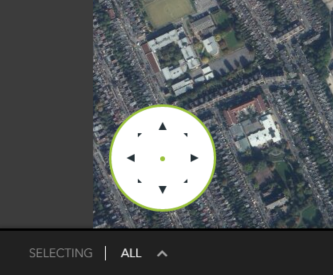 New vertex grab points are shown in white, in every segment of the selected feature. To add a new vertex, simply grab and position one of these vertices. Vertices can be removed, by dragging the vertex, to the dustbin, shown in the corner of the map. Alternatively, pressing the ‘d’ key, whilst dragging a vertex, will cause it to be deleted. The properties Panel allows the attributes of a feature, or set of features to be edited. 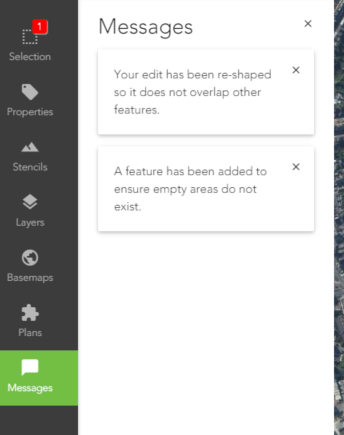 Every edit made in the properties panel, will be added to the undo/redo stack, so can be quickly undone. 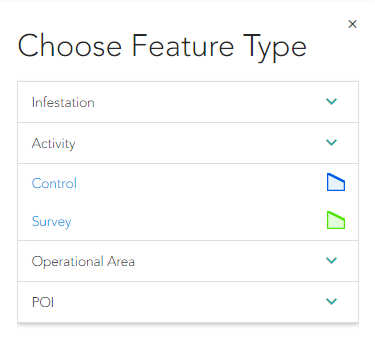 If multiple features are selected at once, the property panel will only show attributes that the features have in common. If the values are different, no value will be shown, but if the user sets a value, then all the features will get this new value, overriding their previous value. If a new feature is being created, and some if its fields are mandatory, but do not have a default value, the property panel will be shown. It will not be possible to continue any other operation until the properties are set, or the new operation cancelled. Certain fields are read-only, if they are calculated fields. Many of tools within Data Maintenance Application involve drawing or digitising a shape on the screen. These tools all work with a 'drawing context' that automatically prevents illegal shapes being created, provides feedback to the user and ensure other options (such as snapping and tracing) are applied. When a tool is selected on the main menu, the application will determine if it is expecting a shape to be drawn or entered on the map. If it is, the drawing tools will be displayed on the map, on the right hand side. The drawing tools can be used to finish, undo the last point entered, and cancel any drawing. The user begins drawing, by simply clicking on the map. As the shape is entered by moving and entering new points on the map, different tools on the drawing menu will become activated. Once the user has finished, they can either click on the tick icon (on the drawing menu), or double click to finish (if using a workstation or desktop device). When drawing on the map, if the editor presses and holds down on the map, a magnifying glass will appear, to make it easier to see exactly where any vertex is being positioned. 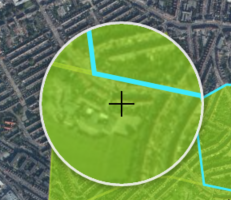 Whilst drawing any shapes on the map, the footer will show distance and area details of the line or polygon being digitised. When drawing the shape it is possible to lock the segment length, and segment angle. This means that very precise segments can be drawn on the map. Once a restriction is set, the digitising environment will not allow the segment to be drawn longer, or at a different angle to that specified. To remove this restriction it is necessary to click 'clear'. It is also possible to see measurements displayed on the map, as the features are drawn. This is achieved by switching the application into measurement mode. The ruler on the footer right hand side, toggles the measurement environment. The digitising environment also supports snapping and tracing. The footer panel has the command for switching on and off snapping, and controlling how the snapping behaves. With the snapping environment, it is possible to control whether the digitising will snap to vertices or vertices and edges. The snapping options also allow control over which layers will be snapped to. If the follow mode is switched on, the application will automatically try and join up the vertex just entered, with the previous vertex, by including all the points in between. This is useful for quickly drawing a shape that shares a boundary. The Data Maintenance Application supports Copy and Paste. 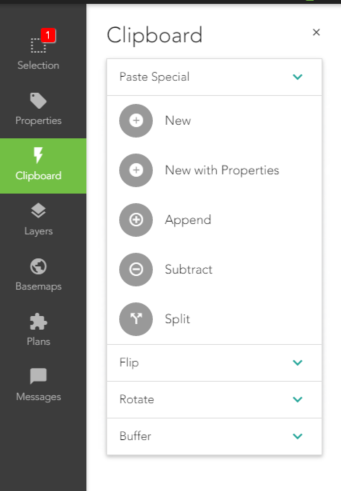 The copy command will copy the selected features to the clip board. The clipboard can then be used in the Paste Operation. Effective use of the clipboard enables some very complex editing workflows to be achieved. When the paste command is clicked, the Paste panel will appear. The Paste Panel provides a range of choices for what to do with the clipboard's contents. New Pastes the Geometry as a new Feature. The type of the feature will be the currently selected type on the main toolbar. New with Properties Pastes the Geometry as a new Feature, along with any Properties that are in common. The type of the feature will be the currently selected type on the main toolbar. 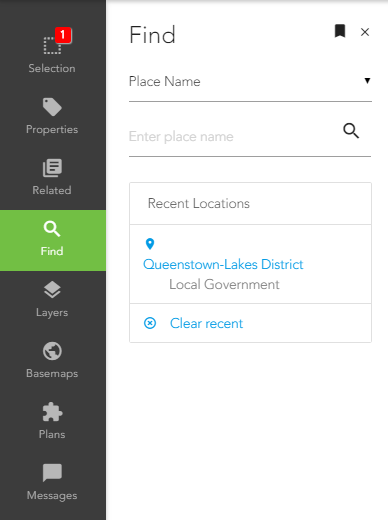 Append Adds the geometry in the clipboard, to the current selected feature on the map. Subtract Uses the geometry in the clipboard and subtracts this from the current selected feature on the map. 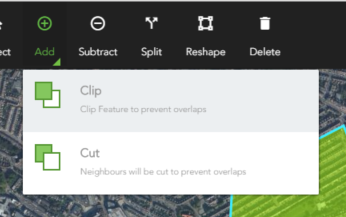 Split Uses the geometry in the clipboard to split the current selected feature on the map. The Paste Panel also provides a number of commands for transforming the contents of the clipboard, such as buffering points into a polygon before pasting as a new feature. Flip Flips the contents of the clipboard around its center point (or an adjusted center point). Rotate Rotates the content of the clipboard around its centre point (or an adjusted center point). Buffer Shrinks or grows the geometries in the clipboard. This feature can be used to convert a point into a polygon. Sometimes it is difficult in the Data Maintenance Application to understand why a particular operation has resulted in a particular change. For this reason a Messages Panel has been added, so that the application can report why it has performed a particular action. 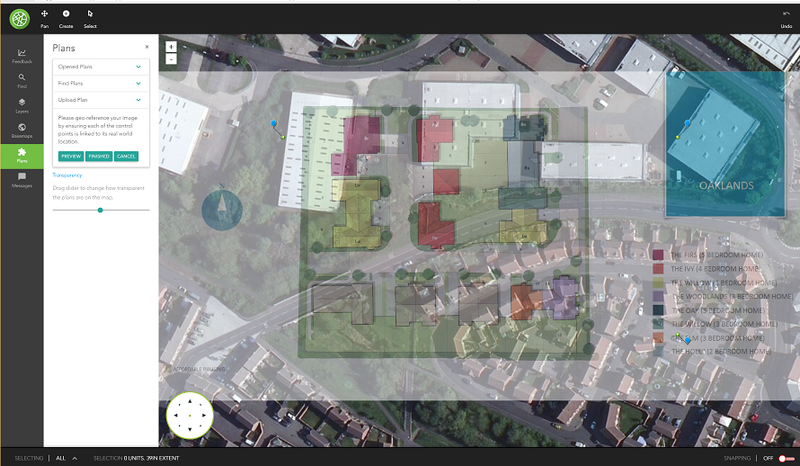 The Plans Panel, allows images to be uploaded and geo-referenced. Once uploaded the plans can be shown on the map. 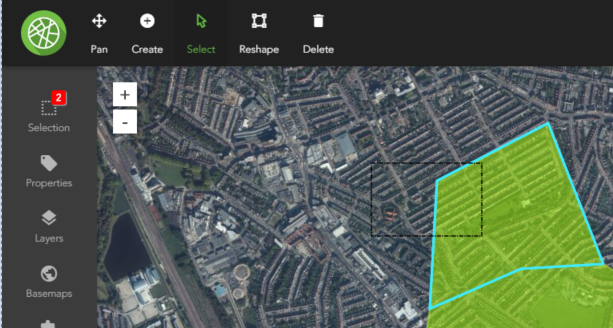 This is useful for when features must be digitised from geo-referenced images. 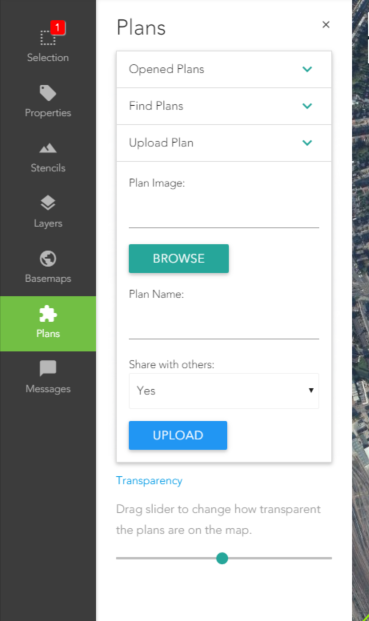 The plans panel allows for uploaded images to be searched for, and loaded onto the map. The transparency can be changed to make it easy to trace over the top of. Click browse and search for an image on your computer. The plan will be shown on the map. You need to adjust the control points, so that the plan will be transformed correctly into the real world coordinates. Whilst setting the control points, you can click Preview, to see how it will end up. 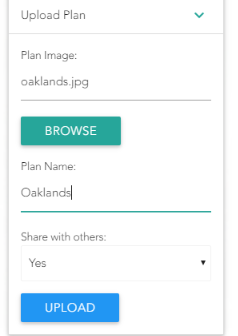 The Plans panel allows you to find and load previously saved plans. 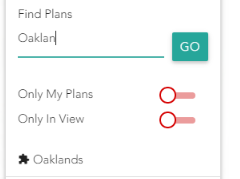 You can simply type the name of the plan (or leave blank) and click Go. The found plans will be listed, and allow you to click on them to add them to the map. It is possible to set whether to search for only your plans, and whether you only want to find plans in the current map extent. Once loaded the plan will be listed in the 'Opened Plans' section, where they can be unloaded. 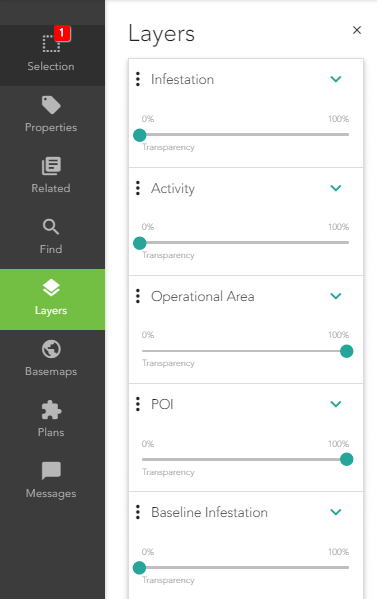 To make it easier to see underneath the plan, you can alter its transparency, using the transparency slider. 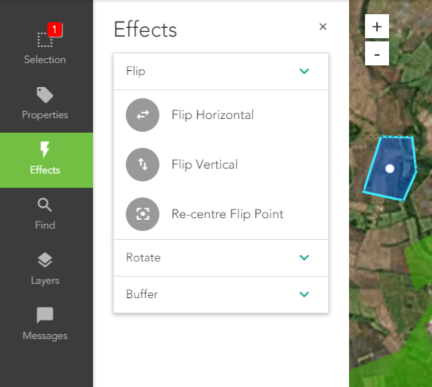 The effects panel can be used to apply an effect to a single selected feature. It is only possible to apply effects to features that are not involved in any topology rules. All effect operations will be in the Undo/Redo stack, so can be quickly corrected. The effects panel works in a similar way to the Paste Panel. However the effects are directly applied to the selected feature, rather than clipboard. Flip Flips the feature around its center point (or an adjusted center point). Rotate Rotates the feature around its center point (or an adjusted center point). Buffer Shrinks or grows the select feature. Extend (Start or End) For linear referenced features, extends either the start or end of the line by a set number of meters. From the related tab the user will see each of the infestations that overlaps with at least part of the activity. By default all of the overlapping infestations are associated with the activity. 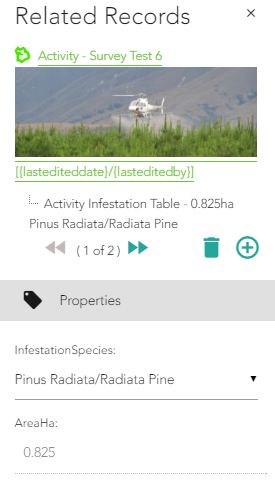 It may be the case that an activity is targeting just one species, and therefore, other species which also occupy the same area (and are represented as a separate infestation polygon) will need to be removed from the related infestations list. 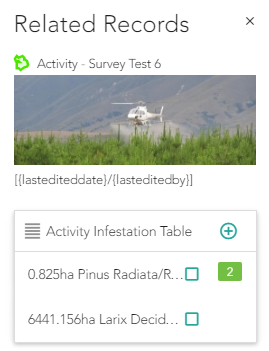 To remove an infestation from the activities related list the user clicks on the infestation on the related screen and clicks the green trash can. The infestation will no longer be associated with our activity. Users may wish to add the chemicals that were used during the activity. This is done in the Data Maintenance Application by clicking on the related tab when with the activity selected. The user clicks on the plus sign in the chemicals section to bring up the chemicals web form. Fill out the chemicals webform and repeat the step above as many times as necessary to add more chemicals.